Photo credit: "Sharon & Nikki McCutcheon". I am IN LOVE with this app! Its aim is to "elevate" your skills in writing, speaking, reading and comprehension, listening and MATH (I know, I'm such a nerd lol). The free version of the app gives you access to a new set of challenges each day to build the skills you chose to elevate. Every challenge is a game designed in collaboration with experts in neuroscience and cognitive learning and are based on extensive scientific research. So basically, you'll have fun playing games that make you smarter! You get to train 30+ critical skills that are designed to boost productivity, earning power, and self-confidence; measure your performance and track your activity progress over time. You get to play three games every day, and have the option to switch a recommendation if you don't feel like playing a particular game, and you can replay the same game for a few times to enhance your score and reach a higher level. As you can see, I'm all about math lol although I was originally excited about Elevate for the chance to improve my listening skills; they've got some fun listening games, with especially a practical one for name recall that would be quite useful when meeting new people and remembering information about them. I'm not sure if there is anyone who hasn't heard of Duolingo yet; in case you haven't, it's a FREE language learning mobile app that gives you the ability to learn a great selection of languages in a fun gaming setting. Learning with Duolingo is fun and addictive as you earn points for correct answers, and level up when you complete a set of lessons. 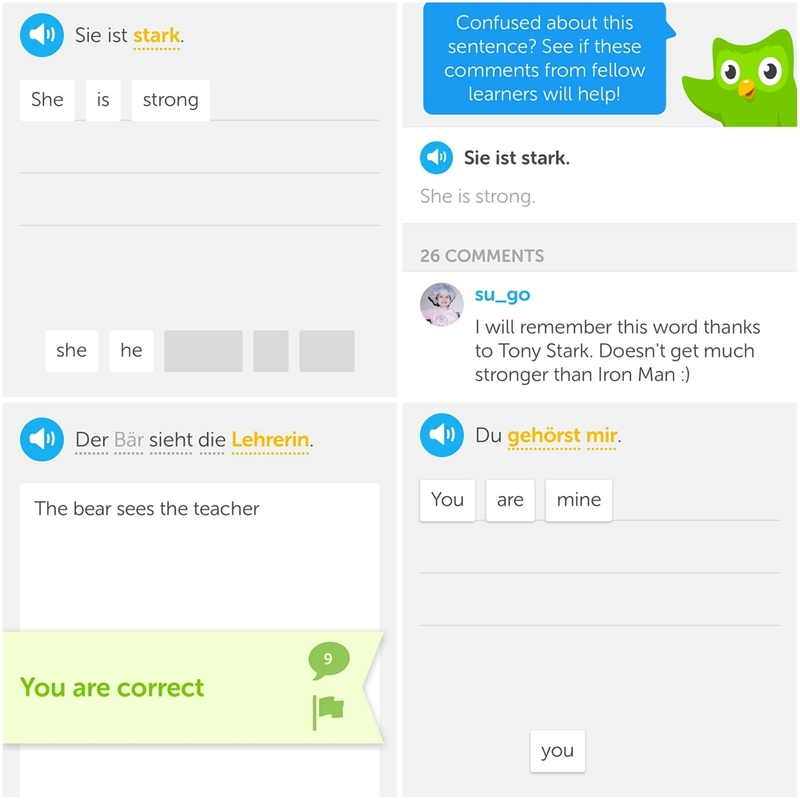 I am currently learning German, but previously I was practicing my Spanish, having learnt it on my own (prior to the existence of Duolingo). What I like about Duolingo is that it's fun, easy, practical and mobile... for anytime anywhere learning. The commenting feature on each sentence is also quite useful as native speakers and other learners often leave useful tips and links to supporting lessons that are helpful, and sometimes they just make really funny comments lol; giving you a feeling of learning in group or in class. What I don't like about Duolingo, however, is that it tends to repeat a few simple sentences for many times in a lesson, instead of adding new terms or more contexts, and sometimes some sentences seem to not make any sense (Have you spotted that in the example above?! lol). In addition, there are no explanations or materials to study and learn prior to lessons, which can sometimes make it very confusing and unclear, and you end up just playing a guessing game or learning through repetition like a parrot rather than clear understanding. So my advice is to couple the Duolingo lessons with another form of serious learning; my favorite is the Michel Thomas Method audio lessons, having used it to learn Spanish and some Japanese (before realizing that audio alone isn't enough to learn a language that has a non-Roman alphabet as I would also have to learn to read and write on my own). This app is available on iOS, Android, and Windows. This one is actually more of a game, I promise... though for brain training as well! Mind Games is a great collection of games based in part on principles of cognitive psychology to help you practice different mental skills. The games, ranging from free to pro, are aimed at enhancing various mind skills such as visual skills, focus and speed, working memory, and attention among many others. I don't use this app as much as the rest, but it's still quite fun for short intervals every once in a while, to keep the brain sharp. While the design may not be that great, and the ad popups can be annoying, the games are fun and addictive, and they're far from being easy. All games include your score history and graph of your progress. The main app shows a summary of your best games and the day's scores on all games. Using some principles of standardized testing, your scores are also converted to a standardized scale so that you can see where you need work and excel. What's good about it is that it doesn't just track and measure your progress against yourself, but it also compares your score to the "normal standards" according to your age and gender, telling you if you're as good, better or worse than others like you. Mind Games is currently available on Android, Apple iOS, Windows Phone 8, and Windows 8.1. If you're into classic fun and competition, QuizUp is the right app for you! It is a free, award-winning multiplayer trivia game, where you can challenge friends and meet new people who share your interests. The topics range from entertainment trivia testing your knowledge of music, movies, and series to more serious knowledge trivia like arts, business, history, language, sciences, etc... And everything in between! The app quickly turned into more of a social network, where you can follow and be followed by people, follow and like topics and communities, and get users' updates on these topics on your homepage, which you can also like and comment on. You can customize your own profile, search for users based on their age, gender, location and interests, challenge them, track your progress against theirs, chat with them, check their profiles to see what they play and what they're good at, their trophies and titles in each game and rank in their country. As you can see, I'm among the top 10 in How I Met Your Mother and and #1 in Family Guy in Saudi Arabia :P. So although I don't quite use QuizUp for really brainy topics, but I still consider it a good memory and speed training app. Even if you're not particularly knowledgeable at a topic, the more you play, the more you learn and the better you get... All while having fun! QuizUp is available on desktop, Android, iOS, and Windows Phone. Although it isn't quite an educational gaming app, but it is definitely worth mentioning. EdX is a massive open online course provider and online learning platform, hosting online university-level courses in a wide range of disciplines to a worldwide audience, some at no charge. It offers online courses from some of the world's best universities, such as Harvard University, MIT, Berkeley University, etc. You get to take as many courses as you like, with flexible learning as most offer an open study plan to learn at your own place, anywhere, anytime. With over 500 courses in subjects like humanities, math, computer science, psychology, etc. you're sure to find something of interest to you, or that can actually be useful in boosting your career level. You can choose to pay for some courses to get a certificate acknowledging your course completion or you choose to audit courses for free, with no need for certification. Part of each course, you will find the detailed courseware with videos and information and quizzes, reading material, a discussion where you'll find a community of your classmates, and you can track your progress in the course. No matter what your interests or career goals are, I'm pretty sure you'll find courses you'd love to enroll in. I'm currently enrolled in an MIT User Innovation course and an Introductory Psychology course; not that I check in daily, but I try to make some progress from time to time whenever I can. EdX is available as a full version on desktop, with a mobile version for iOS, and Android, giving access only to courses that are mobile-enabled. So these are my favorite nerdy apps at this time. Do you use any of them? Or do you have any other nerdy apps you'd recommend I add to my list/mobile? Comment below! Nouf AlQethami was recruited as a Community Manager by Goody back in 2010, when that position was still very new & unfamiliar in the region. In 2 years, her job responsibilities grew with the rise of social media marketing, to become in charge of all of Goody’s digital activities. In her role, she focuses on achieving Goody’s goals of building brand loyalty among existing customers, raising and increasing awareness about the company’s large variety of products,and building a community that maintains a good level of engagement among its target audience which is Saudi females, between 20 and 45, single and married, who are cooking enthusiasts. Based on the brand’s goals and target audience, she developed the social media strategy after brainstorming with the brand manager and marketing department, researching competitors and studying the Saudi market. After thorough assessment, she concluded that Saudi females extensively search for recipes from expert chefs in the region and also from peers in their networks, which were mostly forums. The young females also thought of Goody as a “mommy” brand, something that moms used that is ancient and not modern. Therefore, there was a need for a local online community that can meet these females’ requirements, and building a community using social networking sites would help the brand communicate with the young females and create a “trendier” image. She realized that building a community will take a lot of time, effort and resources, and the company was willing to invest and commit to that. The first step in building the community was opening a Facebook Group, in March 2011, as a small-scale experiment, then in January 2012, a full-fledged Facebook Page was launched. A twitter account was also launched earlier in November 2010 but was only activated this past year. The brand’s youtube channel was also created in September 2010, but only activated about a year ago. Nouf stated that, due to lack of knowledge in those times, it was important to just join these social networks, listen and experiment until she develops a clear content and communication strategy. She continues to experiment with social media as she adds relevant new and upcoming social networking sites into the mix, such as Instagram. The brand had ready content since it was already maintaining an offline cooking magazine as well as a website filled with local recipes; the website was recently remodeled to be “social”, and the content was used to build conversations and engage with the target audience around what recipes they like and use or like to learn, and drive them to the website’s community. The brand focused then on creating valuable content that encourages the audience to engage with it and share it, rather than on pushing for product promotion in a direct and uninteresting way. The content strategy was also supported with a communication strategy that aimed to enable cooking enthusiasts, and support them by giving them space to showcase their cooking skills in The Goody Kitchen community, to turn them into brand evangelists. It’s important to note that the brand uses only the Arabic language in its content and to communicate with its target audience. Nouf has utilized a mix of tactics to achieve the brand’s goals, ranging from online to offline. She leveraged the Goody Cooking Academy, which offers cooking enthusiasts 5 free cooking courses, to fuel content as well as connect with its audience on a more personal level and reward it. She also maintains regular social media competitions on Goody Kitchen’s Facebook Page, as well as third-party platforms such as Yahoo! Maktoob,with prizes ranging from electronic devices, to Goody products, or a feature/ shout-out in the brand’s new magazine “The Goody Kitchen”, which is a very good example of integration between traditional and digital media. Nouf believes that such integration is very important in the Saudi market because there is a big percentage of the brand’s target audience, mostly the older ones, who do not use social networking sites or have preference for traditional mass media such as newspapers and magazines. She believes that having digital and traditional media support each other is a good way to convert the offline audience to online, and to give the online audience something tangible they can keep and value. Nouf has also used some one-off tactics to increase fans/followers growth and engagement, such as product placement of Goody’s fava beans in an episode of a popular Saudi youtube show called “Masameer”, which targeted young males who are the main buyers of this product. This tactic did not only just achieve the best results in terms of views, likes and virality, seen below, but it has also created a big buzz in the Saudi online population on the topic of product placement in Youtube show, i.e. the commercialization of social shows. After the success of this tactic, she was encouraged to also test it on Twitter by getting sponsored tweets from HawaaWorld, the largest community of Saudi females online, and WAM (Women Appreciation Month) that is organized by femi9, the fashion brand. These tactics are great in increasing reach; however, when it comes to increasing engagement, Goody Kitchen’s own Youtube Videos with Chef Sumaya and featuring fans’ own recipes are the most engaging. When it came to measuring the results, Nouf translated its brand goals into metrics: brand awareness meant reach and fans/followers growth, brand loyalty and community building meant engagement, and social2web conversion meant traffic. To measure these metrics, she used tools such as Facebook Pages Insights, Klout.com for Twitter, and GoogleAnalytics, and used competitors such as Shahiya.com, YumYummy.com and SahawHana.com for benchmarking. This post is part of my MBA thesis, titled "Leveraging Social Media Marketing in Food and FMCG Industry in Saudi Arabia". To stay updated with the rest of the thesis, subscribe to my blog! Baker Sartawi is an ex-creative director who has worked for advertising agencies for 12 years, then in 2009, decided to quit advertising and start his own company “Brandwill” that specializes in digital and social media marketing. As the co-founder and digital strategist in Brandwill, he manages many clients such as Munch Bakery, Activia, Mollinex and recently Memories Biscuits, with the support of his team.nHis approach in handling brands’ digital marketing is very top-level, as his strategy is comprised of 3 axis: Web (a brand’s own website) + Online (Third-party web portals and blogs) + Social (One-to-one communication channels). He believes that having a social website is key in any social media strategy, because the website is the only platform that a brand can own in its social media mix, while any pages and accounts created on social networks, and the data of the fans/followers on them, can not be owned. Therefore, before he develops a brand’s strategy, he conducts a digital brand assessment to verify if the brand has an existing website and then he tests its functionality, and analyze its sociability, SEO strategy, technicality and background data. Then, he develops a social media strategy, that is comprised of a technical strategy and a content strategy, that has the goal of migrating fans/followers from social networks to the brand’s website where he can build a database of loyal customers.nThe technical strategy explores and determines what social networks and channels to use, how to integrate them, what posts goes where, and includes the communication policies and measurement parameters. A part of the technical strategy as well, he designs data centers for the brand to host content and store customer data in a centralized database which he believes is key in the technical success. For example, the application that is developed for Memories Biscuits’ website is the same that will be deployed on its Facebook Page, allowing the app to redirect fans from Facebook to the website to gather insights in one database without duplication. As for the content strategy, he believes that it is where creativity comes, where he studies if the brand is commercial or social by nature, and develops content that gives the target audience a good reason to “like” a brand’s page. He studies the brand’s products and services to find a common ground between the brand and its target audience that is not commercially-related, i.e. social, to fuel content that can drive them from social networks to the website (Social2web). He stated Munch Bakery as a successful example, saying that it is an emotional and colorful brand, that makes it easier to connect with its target audience using content that is visually appealing and engaging on a personal level; however, they are still in the process of redesigning Munch’s website to make it web 2.0 friendly. The essence of Munch Bakery’s strategy that Baker aims to achieve is “The Munch Obsession”, which communicates the message “We are cake bakers because we love it” through creative content and product display. To reach Munch Bakery’s goal, Baker employs various tactics, the most successful of which was the sponsorship of Esh Elly episode. Esh Elly is a very popular Youtube show in Saudi Arabia, whose episodes get millions of views within days of their release. In exchange of the sponsorship on Youtube, Munch Bakery also got the chance to have one sponsored post on Esh Elly’s Facebook Page and one sponsored tweet on their twitter account. Baker decided to take advantage of that by making new creative content which was a video of the baking of a cake made for Badr Saleh on his birthday that was designed with his face on it. In 2 days of uploading the video on Facebook Videos, 1’500 fans were converted from Esh Elly’s page organically, and the video had over 400 share, 300 likes and 500 comments on Facebook, and was retweeted about 80 times on Twitter. The video also went viral as an anonymous fan re-uploaded the video on youtube, which, alone, go over 120’000 views. However, Esh Elly’s sponsorship, although highly successful, is very costly. He advises to use such sponsorships only to “test the waters” and increase awareness sharply to drive more people to a brand’s pages where it can engage them using cost-effective content. A great example of that, he shared, is using the Questions feature on Facebook to ask Munch Bakery’s fans what flavor they would like them to bake for Ramadan. The question resulted in over 6’000 votes, but what’s more valuable is that the brand gained really useful insights on new product ideas (what flavors their customers would buy), and it also made their customers feel valued because their opinions matter. Baker measures the success of his strategy by setting Key Performance Indicators according to brand goals and using various analytics platforms such as Hootsuite Analytics, and Klout. He also uses Hootsuite for listening, moderation and community management. Although he measures audience growth rate and engagement rate, he feels that the best KPI of social media is “virality” as it is a good measure of how great the content is based on how many shared it to their own networks. Ahmad Kammoun is the Creative Director at Saracen Advertising, responsible for idea creation and strategy of social media marketing for various brands, including AXE Middle East. Axe Middle East started its social media marketing with a Facebook page on June 27, 2011. Efforts were focused on the entire of Middle East, but earlier this February, they adopted a more specific approach for Saudi Arabia, lead by Ahmad. Ahmad stated that Axe found more interactivity with its audience online, through social networks, since its clientele is highly mobile & cyber. Being a “fun” brand, it found a cost-effective way to humanize and personify the brand for its target audience. To increase its sales by diversifying its clientele. The brand defined its target audience as: Saudi men between the ages of 18 and 35, single and married, interested in learning about attracting women, tech savvy, and care more about having an attitude rather than just looks. To achieve these goals, Ahmad kept focus on Facebook as its young adult male-dominated network makes it ideal. It is important to note, that the Facebook Page is managed by different admins for the various countries in the Middle East, but Facebook’s feature of allowing Pages to target specific countries with each post makes it possible to keep content and fans’ engagement separate for each market. His approach is to keep Facebook fans engaged with continuous campaigns that vary between traditional campaigns driving traffic to Facebook or inviting Facebook fans to take part, online campaigns that extend to offline activities, and sometimes separate online & traditional campaigns that don’t have the same message. Ahmad believes that a mix between traditional and Facebook campaigns works best for its audience to see the brand’s “face”, and get them to interact with it, giving 80% for online activities and taking 20% of it offline as to keep costs low while still keeping in touch with the audience. Ahmad’s content strategy for the brand is to create his own content, rather than depend on sharing third-party content. The approach is to focus on the fans’ interests, such as college days, cars, football, etc. For example, when Eurocup 2012 was running, the page’s content focused on teams, games and scores, such as in image below, where Axe Middle East asked its Saudi fans to vote for the football team they support in Eurocup. The question resulted in 150 votes. Axe Middle East engages its fans with Questions. Ahmad also tried to maintain the level of engagement by launching photo contests; however, it wasn’t very successful so he rectified the tactic by “taking it offline” and inviting fans to visit Axe booths where they can have snapshots of themselves and get a free Axe deodorant in return, which salvaged the situation. He also successfully used the fact that photo posts has higher engagement according to Facebook insights, and created mini-game posts such as “Spot the differences (between 2 photos)”, and puzzle photos that increased the virality of the post by asking fans to “share” them if they find the answers. The image below is an example of a post that got 23 shares. Axe Middle East Increases Virality with Photo Puzzles. Another example of highly-engaging posts are challenge posts, where fans were challenged to post 20 comments without being interrupted by another comment, and it resulted in over 400 comments. Nonetheless, Ahmad primarily believes that the best tactic to drive engagement is creating and using “apps”. In the beginning of March, The Axometer App was launched, where fans can play online or join an Axe booth at malls to play, and measure their level of awesomeness and ability to attract women. Even without prizes, the campaign resulted in an organic increase of 19’000 fans in a month and a half. Therefore, he plans to have 6 apps per year, that are supported with offline campaigns. He also included Twitter in the social media mix, starting June; however, it didn’t get as much success even when he tried to convert Facebook fans to become Twitter followers and offered incentives. He believes it did not work because Facebook users and Twitter users speak different “lingos” and therefore, the majority of those who prefer Facebook, do not understand Twitter. He realizes that mere experimentation and engagement does not work on Twitter, and that a separate customized strategy should be developed to succeed on this network. The main challenge that Ahmad faced the social media marketing of the brand is the cultural limitation in Saudi Arabia. Globally, the brand’s essence is “the mating game” that revolves around helping guys attract and hook up with hot women through using Axe deodorant. This called for re-adjusting the brand’s essence to respect the local culture while still trying to maintain harmony with the global brand image. Another challenge that Ahmad faced are the seasonal drops in engagement, for example, during exam times where the majority of the young fans spend less time on Facebook. Ahmad tried to overcome the drop by sharing content focused on aiding fans in the occasion such as studying tips. Ahmad knew that the key to strategy success is continuous measurement. He used Key Performance Indicators (KPIs) to set targets for 2 important Facebook metrics: Fans’ growth rate, and engagement rate. He tracked those KPIs using Facebook Insights solely, with no aid of third-party measurement tools. The effectiveness of the apps was measured through analytics provided within the apps that measure what features were used most and what weren’t, which provides guidelines for the future apps. Lastly, consumer insights and reflect on sales were used to measure the success in increasing sales (brand goal) by having promoters at offline activities gather data from/about customers. After a long research, which you would have probably heard me complain about keeping me up all night for a month, it's finally done! I'm still working on editing and perfecting the thesis, but to not keep you any longer, I published a preview of the abstract and table of content. Although the thesis, as the title implies, focuses on social media marketing for Food and FMCG brands in Saudi Arabia, it provides a universal framework for building a social media strategy for most brands in any market. The thesis also includes references to various links and resources that form a great reading list necessary for you in building your own customized strategy and understanding of social media marketing and communications. And of course I'll be here to answer your questions or welcome your feedback, so go ahead and start by going through the preview below and leaving me a comment afterwards. Don't forget to subscribe to my blog to stay updated once I start publishing the full thesis! I'm Manal Assaad, aka The Manalyst, a Branding Fanatic, Marketing Enthusiast, and Media Addict. By profession, I'm a Social Media consultant with a strategic marketing sense, a keen eye in design, a quirky style in communications, and avidity for publicity PR. By passion, I'm into travel, psychology, sociology, mythology, movies and TV series, technology and gadgets, music and dancing, languages, art and culture, fashion designing and styling. Weather here is becoming #Lebanese... It's making me crave our grilling tradition of lamb cubes and kofta, with garlic sauce, fries, hummus and tabbouleh. Nothings says "#Lebanon" more than a feast for the eyes and the stomach. Speaking of which, feast your eyes on the #beautiful #saifivillage in #Beirut! What food traditions mark the warm seasons in your #culture? I call this #portrait: "Don't do your social media pose. Just look at me!" because that's what he said to me 😂 Do you have a "social media pose"? Yes that's snow behind me that's taller than me! That's how it feels like in #Emden like 90% of the year, even when the sun is shining, but without the snow aestethics lol Q: what's the most extreme weather condition you've been in?! I call this portrait: Boyfriend jackets and sunset hues... Also, when you see so many photos of me that aren't #travel related, it just means I'm at home and have no interesting places to show you lol moreover, what is your plan for Easter? #Spring is here! It's time again for life in full color, and planning trips that you might not go on because you don't know where life will be taking you and where you'll end up in the summer... Or is that just me?! Some of the trips that I thought I'd be taking in my life but ended up not are to the US, Ireland, Andalusia, China, Kenya, among others. Which #traveldestinations did you have plans for that fell through? I think looking at this photo, most people wouldn't guess it's in #Minsk. I don't know what we went there expecting, but we were certainly surprised and delighted by what we saw! So I put together my top 4 reasons to exploring Minsk, along with details about the visa should you want to visit... And you definitely should! Link is in my bio 👆 What's your top reason for visiting a city? I leave #Minsk tomorrow with quite the positive impression... Positive to the point that I will write a #blogpost about my experience, including the #visa. If I can summarize my experience in #Belarus in one word, it would be: surprising! I guess that happens when you visit a country you've heard not such good things about, or you didn't even know much about, then see it for yourself and it exceeds the expectations you had... Not that it could be amazing or special, but just better than you thought it would be. What country have you had a similar experience with? 4 Reasons You Should Explore Minsk, But First How to Get the Visa!